Morgan is missed so much by her Mom and Dad and brother Simmy. She was loved by so many and had lots of friends within BBR organization. We loved her with our every ounce of being and are so crushed living without her now, or trying to. We miss her so much. After getting the biopsy results, it was determined she had a blood disease. She had a large mass/tumor removed from her hind quarter the day after Labor Day and she never pulled out of the surgery. She just kept getting worse and worse and didn’t eat or drink any longer. We miss her so much and are simply devastated without her. 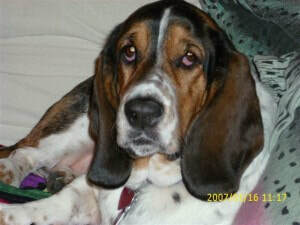 Four years just was not long enough with our wonderful Morgan we adored and cherished so much. 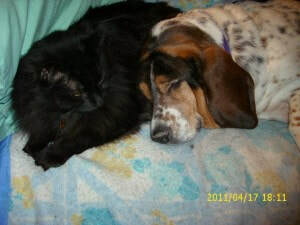 Since her passing, we feel she gave us our newest baby Basset to love, Babette. All signs pointed from Morgan in Heaven to adopt Babette and we are thankful for giving us those special signs to love again. 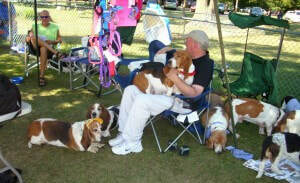 Morgan’s last BassetFest she was able to attend (before her passing on Sept. 10, 2011, only 8 years old). 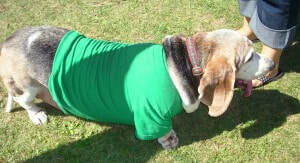 The Basset with the green shirt on was a BIG, BIG Basset — we thought he/she was so cute – BIG BASSET — we nicknamed him, “Tank”. 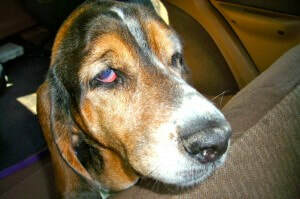 Morgan sure loved always attending BassetFest, but this year was different. She wasn’t feeling well for starters. 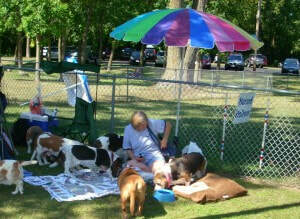 Our long-time friends, previous foster mommies, Patty Sinn and Laura Langanki, were not able to attend. Morgan always loved making large contributions from her donations she had collected.